"Sen elektro, ni ja bezonas kandelojn." Translation:Without electricity, we certainly need candles. Se la okazo ne jam okazis, sed oni pretigas por ĝi, vi diras vere. Sed mia kompreno estas la donita frazo estas respondo al: "Ho, tuj ni estas sen elektro, kion ni lumiĝas la vespermanĝon?" Mi esperas ke iu tien havas torĉon. Vi tute pravas. Cetere, cxu mezepokaj torcxoj? 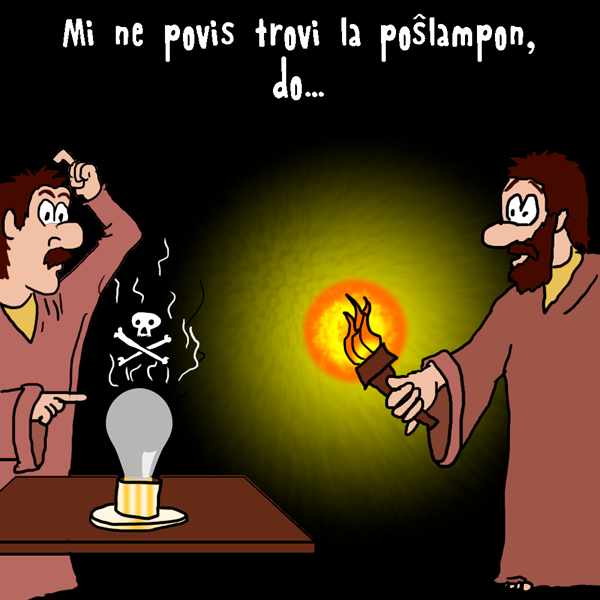 Cxu vi volas diri "posxlampo"? Ne metu ilin apud la kurtenoj! Estis Profesoro Plum, en la banĉambro, per la kandelindo! Kandelingo. Kandelindo is something worth(y of) candles. Not a fair listening exercise. "ni ja" sounds a lot like "nia" to the unpracticed ear. You're not getting a grade at the end of this Ideally I would like the distinction to be more clear, but you'll hear this sort of thing in real Esperanto. You'll need to train your ear to figure out that "nia bezonas" doesn't make sense, but "ni ja bezonas" does. I listened a few times and heard "nia". Like Salivanto said, I knew it didn't make sense, but I still could not think of "ni ja". Listening to it today, I think that Salivanto is a bit of a wiener. This is a recording which should be put on a "re-record" list for an improved version of the course. "Ja" is an emphatic particle and should probably be more clearly emphasized than it is on the recording. No wonder people are having trouble with it.